Designing Boat Biminis Right First Time Is Not Easy! In sunny climes, sail boat biminis are essential to provide shade to the cockpit, thus preventing the occupants from getting too crispy. In their simplest form, biminis are made up as a canvas canopy supported by a folding tubular stainless steel frame, with the whole shebang held in place by adjustable webbing straps fore and aft. When the boat is heeling, and the sun's on the windward side, sidescreen extensions hooked to the guardrails will return shade to the cockpit. But few sailboat cockpits are designed with future addition of boat biminis in mind, the ergonomics associated with winch and helm positions taking priority. Sail Boat Biminis as an Extension to the Sprayhood? Most UK sailboats sport a wide sprayhood for fairly obvious reasons. A relatively simple but effective boat bimini can be fashioned by attaching the forward edge of a suitably shaped piece of canvas to it. The after edge, stiffened by a batten, can be supported by the backstay if the mainsheet is forward of the cockpit, with the corners tensioned by webbing straps clipped to the coaming. Otherwise boat biminis must be supported by a frame attached to the cockpit coaming such that it is cleared by the mainsheet. This type of bimini can often be developed by the addition of zip-on or roll-down back and sides, to fully enclose the cockpit when in harbour. The downside of this approach is that it will be necessary that the windows in the sprayhood can be zipped out to provide some airflow through the cockpit. The zips will be an area of weakness, and will eventually leak. Incidentally, our American friends call our sprayhood a dodger, and what we Brits call cockpit dodgers, weather-cloths. Attached to the after edge of the dodger, this bimini with side panels attached provides a great deal of protection for the cockpit, but would not be practical when underway. Freestanding or Folding Boat Biminis? 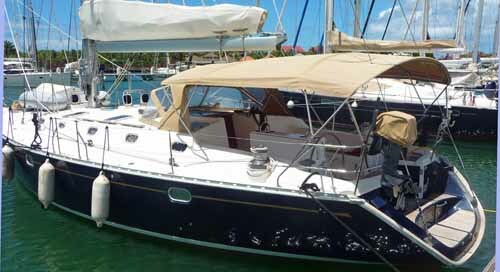 This bimini provides good shade for the cockpit when underway, without obstructing access to the deck. A fixed version of a boat bimini can be designed to incorporate a boom gallows, support solar panels and provide extra handholds in the cockpit. But unless the cover is easily removable, it's also there when you don't want it, such as in strong winds. More importantly, if the bimini impedes access to and from the cockpit at all, it is best if it can be removed during the hours of darkness. On larger yachts, boat biminis can become quite a substantial structure, such that it would be a handful for the crew to lower it at sea. This problem is overcome by making one section of the frame fixed, usually the aft section, so that the remaining frames can fold back to it. 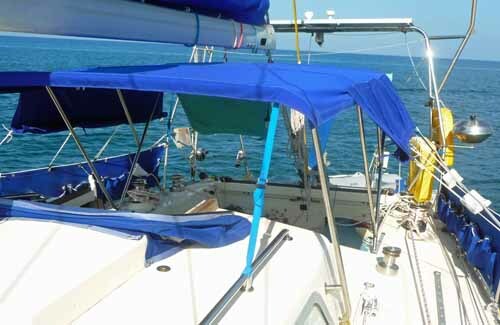 This can eliminate some of the difficulties referred to below, but creates additional windage and weight aloft that could be reduced by folding the bimini down flat. Should Boat Biminis Fold Forward or Aft? the position of the mainsheet traveller. Generally, if it's mounted outboard of the winches it will need to fold aft, astern of the winches, otherwise it will lie on the headsail sheets. 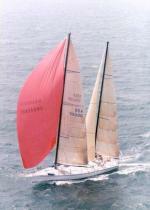 If the mainsheet traveller is positioned at the after end of the cockpit, the folded bimini must not foul it, and the mainsheet must be clear of any part of the raised bimini at any point of sail. The position of any runners or checkstays when set up must also be taken into account. If the boat bimini mounting point is inboard of the winches, then the limitations caused by the headsail sheet leads will not apply. But the bimini will be narrower and the shaded area below smaller. If it folds forward it must not fall across the companionway, or foul a mainsheet traveller mounted at the forward end of the cockpit. The maximum height of the bimini is governed by the clearance under the boom when the mainsail is sheeted in hard. But it should not be any higher than necessary or shade when heeled may be reduced. Ideally about 100mm of clearance above head height should be available when sitting out on the coaming, or when standing in the cockpit well. It should be long enough to protect the helmsman and cover as much of the cockpit as possible, but the longer it is the more steel hoops it will need to support it. The maximum width will be determined by the position of the mounting points either inboard or outboard of the sheet winches. Mounting Point, and Fore And Aft Support? The ideal fore and aft mounting position will be largely dependant on the previous considerations concerning folded position and height, but if you were not yet aware that compromise is a major part of yacht design, you will now become so. it's smack in the middle of your favourite sitting-out position. Mounted on a track, this bimini when folded down can be slid aft where it's out of the way. Some of these problems can be overcome by using sliding fittings at the hinge points and by mounting the whole shebang on cars which slide along lengths of track either side of the cockpit. But there's no short answer. Just make up a pattern from timber battens or light tubing and play around with the geometry until you get it as "right" as you can. Adjustable webbing straps attached to each corner will secure the bimini in position but may impair access in and out of the cockpit. Alternatively if space permits, short stainless support struts pinned to the coaming can be used. 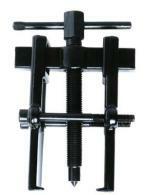 The pins will be of the quick-release type which will enable the bimini to fold in the same way. Ideally the frame should be fabricated in 25mm stainless steel with stainless steel fittings throughout. Aluminium tubing can be used and is cheaper in the short term, but it is hardly strong enough, will corrode, and any stainless fittings used with it will seize solid after a time. The canopy is best made from UV-resistant polyester or acrylic canvas, sewn up with UV-resistant thread. If you possess the necessary skills and equipment to do the welding, tube cutting and bending yourself, then all the other stainless steel fittings can be purchased seperately. Otherwise, I would recommend that you get a stainless steel fabricator to bend the tubes and weld in the end fittings. He will be very pleased to work to your design, as if it doesn't fit it won't be his fault. The cover is best made from uv resistant polyester or acrylic fabric, sewn up with uv resistant thread. Some yachtsmen favour white fabric, as it reflects the heat. However it can still let the sun's glare through. For this reason we prefer a dark canvas, relying on a through flow of air to dissipate any heat. Whilst your sailmaker will be happy to make the cover for your bimini, you can save a few pounds by making it yourself. You will need a robust sewing machine though, ideally one with a walking foot and a zigzag stitch facility. Incidentally, if you do go down the make-it-yourself route, it's worth thinking about incorporating a rain-catcher in your boat biminis. 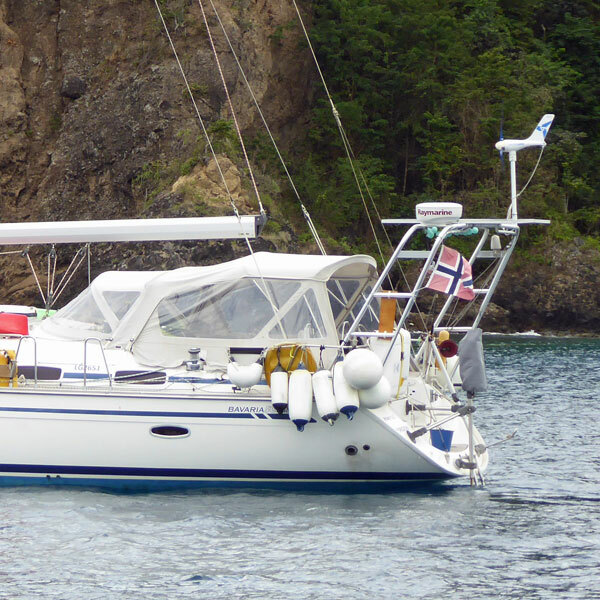 A bimini with roll-up sidescreens. In this shot they are in the halfway-down position. It was in designing Alacazam's boat bimini that the foregoing issues became apparent. Only after the best part of a day messing about in the cockpit with timber battens and bits of string did I feel confident to commit to stainless steel tubing. But now we have a simple, effective, aft folding boat bimini with roll-up sidescreens that takes only a few minutes to put up and take down, and which now ranks alongside the Aries Self Steering Gear as one of the indispensable items of cruising equipment.